My State. My Life. is an education initiative created to inspire students to embrace the positive future that awaits them. Formed by the Governor's Work Force Planning Council, My State. My Life. fosters awareness of the educational and career opportunities available to West Virginia's young people, helps them establish goals, and shows them helpful pathways to reach these goals. Recognizing that there is no effective "one-size-fits-all" approach to education and career planning, My State. My Life. is a valuable tool by which students can find the education, certification or training that is most compatible with their talents, skill sets and career goals. 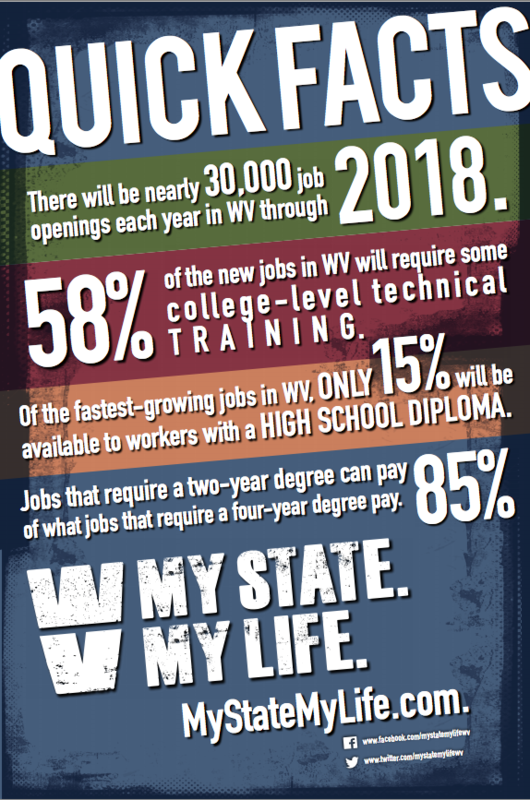 A brisk economic landscape in West Virginia with thousands of good jobs will continue to be available to young people with more than a high school diploma. My State. My Life. can help our young people secure these great jobs and careers, and live great lives.